Christopher Wray testifies during his confirmation hearing before the Senate Judiciary Committee on July 12, 2017, in Washington, D.C.
Four months into the new job, his predecessor is sharing deep thoughts on Instagram, his boss is tweeting that his agency's reputation is in "tatters" and lawmakers are blasting out dueling press releases to make the case that important decisions have been infected by politics. It's not easy being FBI Director Christopher Wray. On Thursday, Wray will get a say of his own when he appears in Congress for his first oversight hearing since the Senate voted overwhelmingly to confirm him in August. Here are a few things to watch. Wray declared at his confirmation hearing that the probe of Russian interference in last year's election was not, as the president has claimed, "a witch hunt." 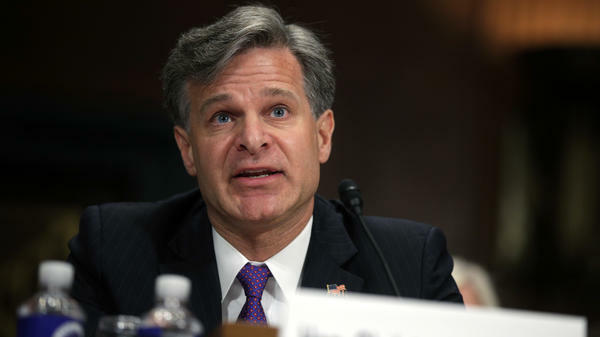 Wray also proclaimed his admiration for his former Justice Department colleague and previous FBI Director Robert Mueller, the man leading that criminal investigation. Since that time, Wray has mostly operated outside the spotlight, and he's kept his opinions of the investigation to himself. Both Democrats and Republicans on the House Judiciary Committee are likely to try to nudge Wray out of neutral gear and to take a position. The Russia probe already has netted criminal charges against four people tied to the Trump campaign, including onetime chairman Paul Manafort and former national security adviser Michael Flynn. Does that mean Mueller is reaching beyond his mandate? Do text messages sent by Peter Strzok, a high-ranking FBI agent who worked on the Hillary Clinton email probe and the Russia investigation, suggest politics played a part in law enforcement decisions in either case? Should there be a second special counsel appointed to investigate the investigators? Can the president, who has denied wrongdoing, be charged with a crime while in office if prosecutors conclude they have enough evidence to charge him? Look for members of Congress to lean on Wray about all of this. "The House Judiciary Committee has an important responsibility to keep a watchful eye on the FBI to ensure it is fulfilling its missions and that it follows the facts wherever they lead without political interference," Chairman Bob Goodlatte, R-Va., said in announcing the hearing. "We look forward to hearing from Director Wray on the many issues facing the FBI, concerns about the politicization of the Bureau, and on answers to the many questions Members have regarding issues before the FBI," Goodlatte added. The job Wray filled only opened up after President Trump fired his predecessor, James Comey, in May, amid questions about Comey's loyalty to the White House and the persistent cloud of what Trump told NBC News was "the Russia thing." For his part, Comey has not gone quietly. Instead, he's penned a book on leadership to be published in the spring of 2018. And he routinely posts thoughts from the Bible, philosophers and world leaders on his Instagram and Twitter feeds. Recently, Comey spoke up on behalf of the independence and the integrity of FBI employees, who have faced criticism from the president this year. This week, Wray himself sent a message to bureau employees advising them to "keep calm and tackle hard" amid the current adverse climate. And, at his confirmation hearing, Wray pledged his loyalty was to the Constitution, not a political regime. "I will never allow the FBI's work to be driven by anything other than the facts, the law, and the impartial pursuit of justice, period, full stop," he said at the time. Democrats on the House Judiciary Committee will no doubt want to ask Wray about his contacts with President Trump and others in the White House this year. In a matter of weeks, an important electronic surveillance tool will expire if Congress does not reauthorize it. The murder rate has spiked in several major American cities. Courts have thrown out corruption charges or reduced sentences of public officials accused of bribery and other offenses, following a Supreme Court ruling that limited the tools the Justice Department's public integrity unit can use to attack graft in state houses across the country. The bureau also has open investigations into activity by sympathizers of the Islamic State in every one of its field offices. The FBI, in short, has its hands in many baskets. And after the questions about Russia and Trump, members of the committee may want to discuss some business in regular order.